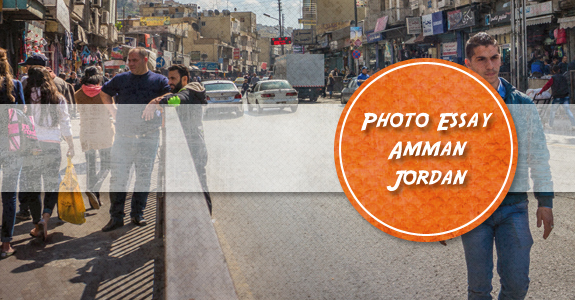 Amman is the capital city of Jordan, and with an approximate population of 4 million it is the most populous city and is the country's economic centre. 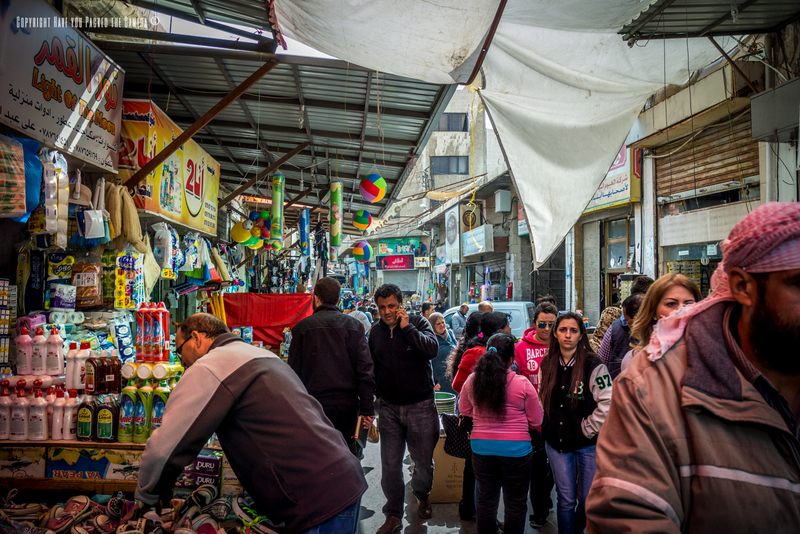 During my Jordanian adventure with G Adventures in 2015 I stopped several nights in the capital and enjoyed exploring some of the downtown area and street markets. Taking photographs in the side streets and markets was a little difficult – The light levels were low so I did not have great shutter speeds, and even with a smaller aperture it didn't help a great deal. To account for this I just held the camera as steady as possible to minimise any movement when taking the photos. I walked through quite a few of the streets in Amman around our hotel and liked the inviting colours of the buildings, the palm trees lining the streets, and some of the cool old cars people had. 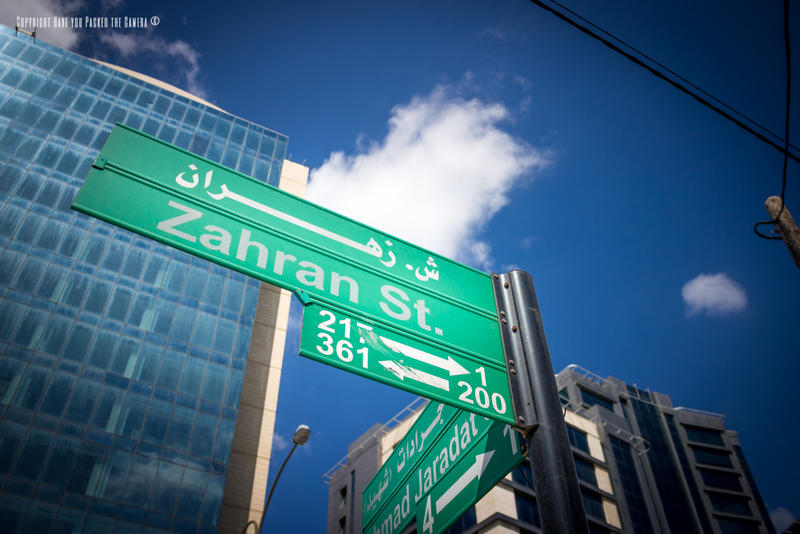 I liked the style and colour of the street signposts in Amman, the bold green colour and the Arabic and English dual display stands out. In this photo you can see some of the Amman's skyscrapers looming behind the signpost. 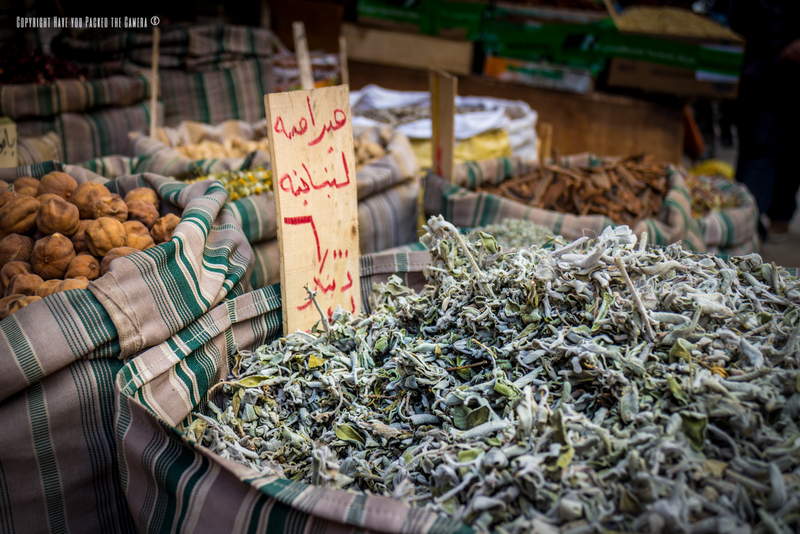 The local markets in Amman were fascinating and I loved looking at all the different food displays such as this spice shop – So many colours and smells to take in. 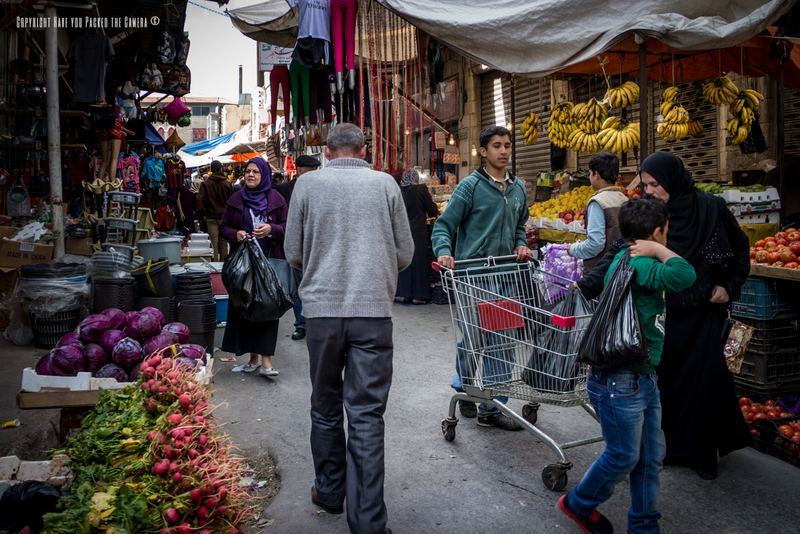 I was cautious of walking through the side streets and markets – I didn't know Amman and I had no idea where I was going. I only took a few photographs as I didn't want to attract attention, but overall I felt safe and really enjoyed taking in all the sights. The hustle and busyness of the markets and side streets was fascinating; people would come and go, barter with shop-keepers for their goods, talk to friends, test out the products on display. It felt like an involving experience and was definitely an overload on the senses. 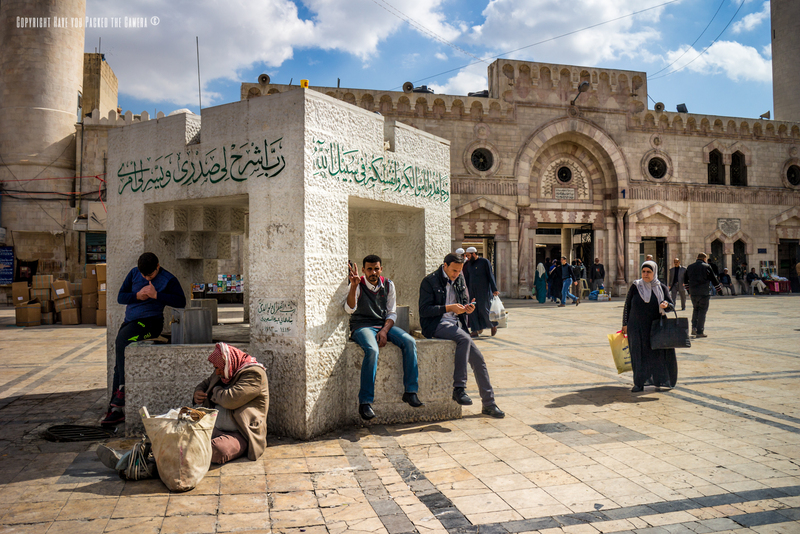 This is one of my favourite photos from Amman; I like the composition, the small white structure in the foreground, and the fact that one of the men is giving me the peace sign! 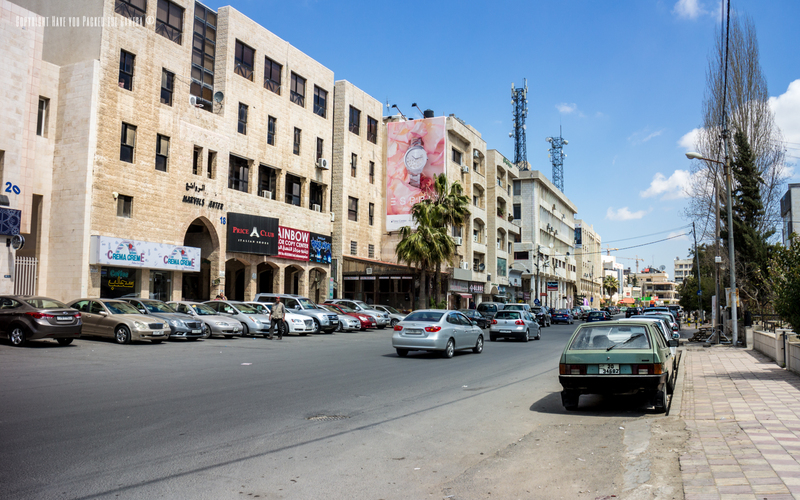 The streets of Amman, especially in the downtown area were chaotic – There was a constant stream of traffic and crossing the road proved very difficult. I loved the noise, the chaos, the movement and the people, it was totally fascinating.